A few days old, but definitely worth watching. The war is over, the analysis and debating begins. Bloggers are typing away their thoughts on what has just passed in the Middle East. From war to war (which is a title of a book by Nadav Safran), that is the context in which we need to evaluate our century-old conflict with Israel. You can't isolate each chapter or war or slaughter and analyze it without the larger context of the conflict. The press conference by the Israeli prime minister and his defense minister was remarkable: less triumphalist than usual, and certainly vague about goals and successes. Now we can evaluate the goals within the context of Israel's declared goals, and within the context of Israel's strategic plan. For somebody of my age, I can say this at first: that from 1948 until the 1990s, every Israeli military success more smashing the one before: the 1973 was a different story because it was the only Arab-Israeli war that was initiated by the Arab side (remarkable when you think about the propaganda of the "beleaguered Israel"), and it was bungled by the Egyptian (Nazi) dictator, Anwar Sadat (Jimmy Carter's favorite personality and friend), and Israel (contrary to present-day Arab states' propaganda) wound up winning overall at the end. So Israel's strategic posture was predicated on intimidating 1) the armies of the enemy; 2) the population of the enemy. Israeli psychological warfare succeeded for decades in convincing the enemy that Israel is way too mighty and way too invincible to be damaged by any military effort. Arabs reached a mood of defeatism that permeated the political culture, and helped in securing the survival and propaganda of the ruling regimes. Israel's tactic was meant to discourage any political violence or even defense from the other side. You also need to compare to the times when Israel faced non-state actors: we have different episodes: from Al-Karamah battle in 1968 (a crucial watershed in fida'iyyin recruitment), to the various chapters of Israeli invasions of Lebanon culminating in the 1982 invasion of Lebanon. I am quite familiar and witnessed the responses to Israeli invasions of Lebanon. It is in that context that I find Gaza (under siege and cut off from the world with Egypt playing the role of the ally of Israel) to be an utter failure for the Israeli side. I never expected much from Hamas in terms of military effectiveness, and I think that the Israeli-Egyptian-Saudi-Dahlan plan was based on a low estimation of Hamas' military effectiveness. In previous confrontations in the West Bank or in Lebanon in the 1980s, the Israeli military would bomb from the air for a day or two, and then advance swiftly. And that was exactly what happened in the invasion of Lebanon in the summer of 1982: now, the lack of stiff resistance back then had to do with many factors, including the lousy leadership of `Arafat (who cared about preserving his little empire more than about resistance and who is not dead enough as far as I am concerned, and may his grave deepen), the gap between people of the South and the resistance, and the financial regularization of the PLO's fighting force, and the psychological factor that often curtailed the ability of the fighting force, all helped the Israeli plan. True, there was stiff resistance in some places: like Rashidiyyah and `Ayn Al-Hilwah but it was sporadic and disorganized. Only in West Beirut, a strong fighting force was prepared and they were ready for a confrontation with Israel, and that is why Israel never invaded the city: it only waited until the evacuation of the fighters and then supervised the butchery of the women and children in the Sabra and Shatila camps--slaughter of women and children is a classic specialty of the Zionist forces even before the establishment of the state. But Hamas performed far better than the expectations of its enemies and even of its leadership in Syria and Lebanon. Israel would have succeeded if it achieved what it wanted: to achieve an unconditional surrender of Hamas. That's what it used to get from Fatah in the West Bank: Arafat would negotiate the terms of his surrender with third-parties and that would be that (like in Bethlehem). Yet, Hamas defiance and the launching of rockets continued to the last day--in fact it continues as I write this from what I see on the screen. Hamas leaders did not leave as Fatah leaders and fighters would (in the era under Arafat-Dahlan-Rajjub in the West Bank bantustan after Oslo), but continued in stiff resistance and defiance to the very last end. So Israel failed in 1) achieving a total surrender of Hamas; 2) in propping up the Dahlan-Abu Mazen gangs who are more discredited today than ever. Early in the campaign, Dahlan appeared on Al-Arabiyya and on Egyptian TV and was quite bombastic because he was expecting that the matter would be over in the first week. When that did not happen, he disappeared, and some say that he went back to Montenegro--his news base. 7) Israel failed in creating a new psychological climate in the Middle East: it was expected that Israel would use more massive and indiscriminate violence than before, and that it would try to "shock and awe" more than before because it wanted to kill the image of its humiliation in South Lebanon. That was not accomplished despite the high number of casualties among the civilians. 8) Israeli prime minister today bragged about intelligence successes: but that was inflated. It is true the killing of two Hamas leaders (along with tens of innocent civilians but that is how Israel "assassinates") was a success for Israel but there are other Hamas leaders. Plus, Israel policy of assuming that an organization would die by killing the leader has always been one of the many dumb Israeli miscalculations. The most recent case was in 1992 when Israeli terrorist leaders killed Abbas Musawi (and his family) and they got...Hasan Nasrallah instead. I have no doubt that they probably now regret killing Musawi. And Hamas now operates on the assumption that all leaders may die and they have most likely structured the organization on that assumption, unlike the centrally run, say, DFLP or Fatah under `Arafat. 9) Israel failed to build on the years-old Saudi policy of mobilizing Arab public opinion against Iran, instead of Israel. That clearly failed miserably. If anything, Arab public opinion is more mobilized against Israel than any other time in memory. 10) Israel failed to sell its slaughter as a legitimate contribution to the "war on terrorism". Clearly, the scenes of carnage offended public opinion around the world with the exception of the US and the UN embassy of Micronesia. But there are successes: if Israel was aiming to kill a very large number of women and children, that was achieved to a large measure. Very knowledgeable sources in Beirut tell me that only 5% of Hamas' fighting abilities were damaged in this war thus far, and there will be another round no doubt. But think about Karamah battle. In Karamah: a lot of the lore was built by Arafat's bombast and a unit of the Jordanian army fought with the Palestinian resistance. This time around, Arab and particularly Palestinian public opinion will look with admiration at the performance of Hamas during this 22 days. It is commonly estimated that some 20,000 Palestinians volunteered in the resistance movement after Karamah, and I expect a region-wide campaign of recruitment to the benefit of Hamas. Israel's choice of Palestinian leadership (supported by Jordan, Saudi Arabia, and Egypt), i.e., Dahlan gangs, are discredited beyond repair. I mean, when I read in Saudi newspapers description of Dahlan as an Israeli stooge, you know how Palestinian opinion will regard him--and the fleeing of his men in their underwear did not help either. From 1968 to 1978, the Fatah movement transformed from a band of fighters in Jordan to an army (badly run to be sure by Arafat) with all sorts of heavy weapons. There is now a point of no-return: Arabs are no more afraid of Israeli soldiers. From that loss, Israel shall never recover and it will expedite the inevitable process of the elimination of Zionism from Palestine. The confrontation with Israel is cumulative, and this culmination is now not in the interests of Israel. Many Arabs now talk about the defeat of Israel: I rarely heard those sentiments before 2006. A good video from Haitham Sabbah. Sarkozy is great at flying from capital to capital waving the flag of the world saviour. He scuttled between Russia and Georgia last year, and has made rounds in the Middle East to solve the Gaza war. It is a sign of vanity, a hopeless attempt at making himself and France feel important. Wake up Sarkozy, this isn't the 19th century, and you are not Napoleon. He failed to stop Russia's war on Georgia, and failed to stop Israel from destroying Gaza. "What we are seeing now is a sideshow by people who through their own misjudgments, miscalculations, and ill-advised alliances, have sidelined and marginalised themselves, and made themselves irrelevant to the objectives they are seeking to achieve." This has been our third major rally, and each protest has drawn greater crowds. Yesterday, organisers put the numbers at 12,000, with a range of speakers covering the entire spectrum of the community. Muslims, Christians, Jews, Atheists, Socialists all marched in the centre of Melbourne to condemn Israel's ruthless war against a defenceless population. We had speakers from Christian churches, Jewish groups, Islamic groups, politicians, unionists, and a newspaper cartoonist among others. 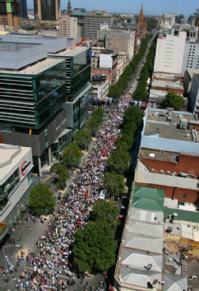 The Palestinian cause has indeed popular support across the entire community in Australia. Pinched this from Beside Beirut. To zoom, simply click on the image, or follow Beside Beirut's link. Hamas will permit Israel a week to withdraw its forces from the Gaza Strip and lift the blockade. Israel is withdrawing its forces, despite a few clashes with Hamas in the north of the strip. Hamas has retained its rocket-firing ability, suffered little damage to its smuggling tunnels, and still remains in power. So what exactly has Israel achieved from this offensive other than causing utter destruction for the lives of the Palestinians? Hamas also needs to tread water with its people. The Gazans do not pour passion for Hamas as the Shi'ites do for Hezbollah in Lebanon. Of course, the blockade hasn't made Hamas' rule of Gaza easy. Israel hasn't given any indication that it will permanently open the crossings, such negotiations are still continuing in Egypt. The one and major positive element of Hamas is that it is mostly clean and corrupt free. The millions of dollars that will now come in aid from Iran, Qatar et al. will reach the people and help reconstruct what remains. But the cease-fire, as highlighted below, does not give way for a long-term solution. We have returned to square one. Nothing was achieved, nothing was changed, despite Israel's promises to "change the reality" in Gaza. All Israel has achieved is the killing of any possibility for a peace settlement. Hamas was shifting towards a moderate position and warming to a two-state solution. You can bet that such a shift is off the cards now. And Abbas? It depends if the Egyptians succeed in persuading Hamas to allow his forces to operate in Gaza. I certainly doubt it, and if Hamas does cave in, Fatah's every step will be scrutinised. It indeed creates a very insecure situation in Gaza, for the Gazans and Israel. Abbas has come out weaker, and has played into the divisions of the Arab world. Instead of standing unconditionally, shoulder-to-shoulder with his fellow suffering Palestinians (as every president of a nation should), he jumped from Cairo and Riyadh - two Arab states that have become increasingly isolated and resented in the Arab world - singing the king's tune. Now that the war is over, Abbas' presidency has come into question. Hamas will include this in the negotiations. Technically, Abbas is no longer the president of the Palestinians, as Hamas has thus far refused to recognise his legitimacy. Abbas needs Hamas' approval to continue his term, which appears unlikely unless a deal can be reached in Egypt. Thus, for the moment, all eyes are on the diplomatic front in Cairo to see who can gain what out of which deal. Unfortunately, there is no fair arbitrer. The Egyptians, Europeans and Americans want to weaken Hamas, and Syria/Iran want to strengthen it and give it international recognition. Syria and Iran will be pleased Hamas survived the onslaught, and will strongly push for a settlement that will favour the Islamists. Israel invaded, bombarded, slaughtered, dropped illegal chemical weapons on civilians and still achieved nothing. Hamas' major concern now is for the people of Gaza, and lifting a blockade that has rendered the vast majority of Gazans impoverished. Israel yesterday declared it has won the war, ended its three-week offensive and ceased fire. Olmert stated that: "Conditions have been created whereby the goals set at the launch of the operation have been more than fully achieved." What conditions and goals is he referring to? The leaders of Israel, aware of its blunders in Lebanon, seem to be keeping a happy face in contrast to the obvious. At the onset of this war, the Israeli trio of Olmert, Livni and Barak stated clearly it wanted to "change the realities" in Gaza and topple Hamas from power. It soon downgraded their objectives to merely halting rocket fire. Indeed, Hamas has been inflicted a heavy blow to its arsenal, but neither its core military or political infrastructure has suffered anything it can't recover from. Hamas still retains the ability to launch rockets, and is still in charge of the Gaza Strip. Also, Israel has arrived at this cease-fire after only 4-days of truly engaging Hamas fighters in urban warfare. Throughout this conflict, Hamas had been trying to lure the IDF into street battles where it knows it can upstage the "invincible army". Wind back the clock 2 years, Hezbollah defeated the Israelis convincingly in urban battles in South Lebanon, preventing an IDF penetration into the country. Assuredly, the IDF still had a psychological hangover from its last war with Hezbollah, and after 4-days of urban warfare with Hamas in Gaza, the signs weren't promising. Judging by reports from Western, Arab and Iranian media, the IDF did an excellent job of surrounding populated enclaves, but failed to penetrate them due to stiff resistance from hundreds of Hamas fighters. Western media reports of Israel entering a dense neighbourhood were often conflicted several hours later when Iran's PRESS TV would announce that the IDF had retreated from the same neighbourhood due to heavy resistance. It became obvious that this mission was going nowhere. Israel was faced with stark choices. 1/ Withdraw without achieving its objectives and lose the support of the Israeli people. 2/ Sign an Egyptian cease-fire that will pave the way for its withdrawal, lift the siege, and work out a way to end weapons smuggling (which I believe to be entirely impossible to achieve, weapons will always find their way into Gaza). The Egyptian cease-fire doesn't hand Israel its objectives, and the Israelis know this. Also, any cease-fire deal would automatically recognise Hamas as the legitimate ruler of Gaza, which is in essence a victory for Hamas. 3/ Continue fighting to a dead-end, and risk a high death toll of IDF should it continue in urban warfare. The Israelis are aware that it is not going to win, and if it continues, the outcome will be akin to the 2006 Lebanon War. 4/ Unilaterally declare a cease-fire. This option avoids signing a deal with Hamas, but instead takes the spotlight off Israel and places it on Hamas. Israel will remain in Gazan territory, the siege will continue, but instead of Israeli guns being offensive, it will be retaliatory to any Hamas attempt to evict Israel from Gaza. The Israeli cease-fire is bogus. It will not achieve an end to this current conflict, and it isn't designed to. It is merely a PR attempt to relieve the Israelis of the intense world pressure it is under by placing the ball in Hamas' court. Israeli forces have no legal right to be in Gaza, and its siege is a crime against humanity. Not that Israel ever cared for international law, but these two factors prevent the cease-fire from having any legitimacy. Israel must withdraw, lift its blockade and sign a truce with Hamas. Israel is trying to avoid this humiliating ending, but it is still in a quagmire. The Israeli public does not support a re-occupation of Gaza, and won't stomach any long-term IDF commitments to the territory. Hamas has vowed to continue fighting, as it should whilst Israel remains on Hamas' legal territory. The Islamists won the fairest elections ever held in the Arab world in 2005, and was forced to compromise its power with an increasingly unpopular Western-backed Fatah. Therefore, Hamas is the legitimate, democratically elected ruler of the Gaza Strip. Would Israel permit Hamas fighters to remain in Sderot or Ashkelon and choke these cities with a crippling blockade? Or Hezbollah fighters in Kiryat Shmona? How does Israel plan to get out of the mess they created? It cannot leave without appearing humiliated, and it cannot remain without causing internal public anger at another occupation of Gaza. Its desire, backed by the US, to reinstate Fatah's influence in the Gaza Strip won't work. Hamas, under intense pressure from Syria and Iran, is rejecting Egypt's cease-fire proposal to allow Fatah forces to monitor the Rafah Crossing. Mahmoud Abbas has been weakened by Israel's war on Gaza. As Hamas' popularity amongst Palestinians and Arabs soar, his image as a hapless, corrupt Israeli puppet has been made clear for all. Despite Israel and the US' attempt to portray an Israeli victory, and indeed, a change in Gaza, the only reality obvious is that nothing has changed. Israel is stuck, and Olmert's attempt to assure the Israeli people that all is under control is far from convincing. The fighting will go on. A story that has been retold countless of times in the past 60 years of Israel. What is Israel to its neighbours, to its colonised victims? It is a cancer, a disease that has inflicted an unbearable pain since it first came to light. It is a state that exploded into existence with firing cannons, and has breathed fire ever since. Was this how Theodore Herzl envisioned his state to be? One important lesson I learnt during my time trapped in Lebanon during the 2006 war was that at the end of the day, none of this matters. Zionism, Islam, Shi'ites, Sunnis, Christians, Jews, capitalism, communism, East, West, Israel, Hezbollah, Palestine, Lebanon ... none of it matters. Take away all the ideologies, philosophies, religions, borders, facades, and what remains of us other than flesh, bone and a soul? Who will remember the dead mother? Or the dead child? In 100 years, would any one even remember what happened today? Should so many people have lost their lives over 60 years for an idea, a religion, a boundary, someone's vision for a nation? The only crime the children of Gaza are guilty of ... was being born in Gaza. Israel's highly publicised war in Gaza has drawn sharp condemnation from the UN and human rights groups, with some UN officials now calling for a war crimes investigation. With the death toll likely to pass 1000 (one-third of whom are children), public outrage and mass demonstrations across the world continue. In the face of new media technology, the internet, and citizen journalism, it has been impossible for Israel's powerful PR machine to compete with the gory images of strewn Palestinian bodies, many of them children, plastered all over the web. Israel's actions have been caught on camera. The indiscriminate bombing of a UN school, a university, government buildings, police stations, and residential complexes all constitute serious breaches of the Geneva Conventions. The most recent controversy is over allegations that the Israeli Defence Force (IDF) is using white phosphorus and cluster bombs. Of course, this isn't the first time Israel has subjected large civilian populations to the horrors of war. In fact, Israel has a long record of targeting civilian centres, and an equally long record of feebly justifying its actions. In 1982, Israel launched a massive invasion of its northern neighbour, Lebanon, in a bloody campaign that claimed the lives of 17,500 people, many of them women and children. Eyewitness journalist to the invasion, Robert Fisk, claims to have seen first-hand the impacts of the use of phosphorus bombs during Israel's siege of Beirut. "I saw two dead babies who, when taken from a mortuary drawer in West Beirut during the Israeli siege of the city, suddenly burst back into flames," Fisk wrote. Israel's Operation Grapes of Wrath against Lebanon's Hezbollah in 1996 was also a bloody massacre. A UN compound in Qana, South Lebanon, that housed 800 refugees was hit by Israeli shells, killing 106 civilians. An Amnesty International investigation into the attack found that contrary to Israel's version of events, "the Israeli Defence Force (IDF) intentionally attacked the UN compound". An Israeli military offensive in the West Bank refugee camps of Jenin and Nablus in 2002 claimed almost 500 Palestinian lives. Subsequent investigations by Amnesty International found that Israel committed "war crimes" in the camps, accusing the Jewish state of: unlawful killings; demolishing more than 3000 homes (many with residents still inside); using Palestinian civilians as "human shields" against Palestinian armed groups; destroying civilian infrastructure; cutting off electricity and water supplies; denying access to humanitarian aid; and torturing thousands of detainees. Sound familiar? Most recently, the July 2006 war between Israel and Hezbollah saw much of Lebanon's civilian infrastructure reduced to rubble. In a war that claimed 1200 lives, the vast majority of which were Lebanese civilians of whom, again, roughly one-third were children (and displacing one-quarter of Lebanon's population), Israel was once more accused of grossly violating international law. Israel destroyed 31 vital government installations such as airports, electricity plants, ports and water facilities, 80 bridges, more than 900 commercial targets, over 30,000 residential properties, and several hospitals. In addition to the widespread carnage inflicted upon Lebanon's civilian population, Israel again deployed its line of controversial weapons. In the dying days of the war, Israel sprayed South Lebanon with millions of cluster bombs that today continue to kill and maim Lebanese civilians returning to their war-torn homes and villages. After initially denying the use of white phosphorus in the 2006 war, Israel later conceded to using the burning, toxic weapon. Tel Aviv was also alleged to have used advanced uranium-based bombs on Lebanon. Deliberate attacks on civilians were frequent in the July 2006 war. One such case was the Marwahin massacre. A convoy of 27 civilians, mainly children, attempted to flee the southern Lebanese village of Marwahin when it was fired upon by an Israeli Apache Helicopter at close range, killing 23 people. "The pilot must have seen what he was doing," recounted one survivor who lost half his family in the killing. "He could see we were mostly children. The pick-up didn't have a roof. All the children were crammed in the back and clearly visible." And we arrive at Gaza 2008-2009. A UN school slaughter of 43 children, a destroyed university, ravaged cities, falling phosphorus and cluster munitions, no electricity, scarce water, food and medicine. This scene has been revisited far too often. Israel's lines of justification when confronted with the realities of its atrocities have also remained weak and inconsistent. When news first hit the airwaves of an Israeli strike of the UN school in Gaza, the Israeli military claimed that it was responding to Hamas rockets fired from the school. After confronted by an angry UN over the allegation that Hamas was using its facilities to launch rockets, Israel retracted its statement claiming it had mistakenly fired on the school, only to then claim that the rockets were coming from near the school. Wobbly Israeli accounts are hardly new territory. Take for example Israel's initial response to its 1996 massacre of the UN's Qana compound in South Lebanon. Israel's then-Prime Minister Shimon Peres justified the attack by claiming it was in response to Hezbollah firing two Katyusha rockets. Aware of the absurdity of such an explanation, the Jewish state later stated it fired on the UN compound as a result of a technical error. However, a UN investigation concluded that it was "unlikely that the shelling of the United Nations compound was the result of gross technical and/or procedural errors." So why has the majority of the world suddenly found a conscience now? New media and the advances of the internet have brought the images and live accounts into people's homes. Israel would have preferred to have no cameras present, as it has repeatedly done in the past and attempted to do again by blocking media access to Gaza. However, Tel Aviv has underestimated the efficacy of new media technology and the easy availability and accessibility to news coverage of the war that doesn't come from major satellite networks and newswires. For many people in the world, this latest offensive in Gaza is the first time they have seen images of Israel's war crimes — courtesy of new media tools such as blogging, independent online media sources, and interactive sites such as Facebook, YouTube and Twitter. But for the Palestinians, Lebanese and much of the Arab world, Gaza is simply another addition to a long list of Israeli abuses. But while new media technology has helped to build a massive international network in solidarity with the Palestinians, it has done little to influence the men and women who hold the reins of power. The blind eye turned by world leaders (including those of Australian leaders) to Israel's constant violation of international law in 60 years of conflict bears much responsibility for today's Gaza war. The hope for an end to this conflict is as distant today as it was the day Israel declared independence in 1948 on the backs of a broken Palestinian people. Israel has maintained the same policy of belligerence since its inception and continues to show complete disregard for international institutions and conventions. Gazans, Palestinians, Lebanese and many in solidarity with their plight sit and wonder how many more Gazas, Qanas and Jenins will take place before the world says No to Israel. The only thing certain is that Gaza won't be the last victim. Several developments occurred today that have astonished me. The first thing I came across was a story in The Guardian revealing demands by senior UN officials and human rights groups for an international war crimes investigation into Israel's actions. The second item was on Australia's SBS evening news. UNRWA's spokesman, Christopher Gunness, bluntly repeated twice in the live interview that the UN is documenting every piece of evidence to use in future investigations. He stressed that those who have committed crimes will be brought to justice. He didn't directly state that an international war crimes trial of Israeli leaders will take place, but this was definitely the implication and he made sure the viewers understood. I haven't found the interview on YouTube as yet, but you can access the interview from SBS' website by clicking on "Watch Online" and scrolling to Gunness' interview. The third and final development was the following article I read by Gideon Levy at Haaretz. Although his article was indeed outstanding, it was the number of supportive comments he received at the bottom of the page that surprised me the most. Is Gaza the last straw? I'd like to think so, but I doubt it. Whilst talk of an international war crimes tribunal is indeed a positive step, and it's great to see voices coming from international bodies and within Israel, at the end of the day the big button lies in Washington. At present and for the foreseeable future, Israel's finger rests on that button. Israel will continue to ignore international conventions, courts and trials as long as the United States permits it. When the cannons eventually fall silent, the time for questions and investigations will be upon us. The mushroom clouds of smoke and dust will dissipate in the pitch-black sky; the fervor, desensitization and en masse jump on the bandwagon will be forever forgotten and perhaps we will view a clear picture of Gaza in all its grimness. Then we will see the scope of the killing and destruction, the crammed cemeteries and overflowing hospitals, the thousands of wounded and physically disabled, the destroyed houses that remain after this war. The questions that will beg to be asked, as cautiously as possible, are who is guilty and who is responsible. The world's exaggerated willingness to forgive Israel is liable to crack this time. The pilots and gunners, the tank crewmen and infantry soldiers, the generals and thousands who embarked on this war with their fair share of zeal will learn the extent of the evil and indiscriminate nature of their military strikes. They perhaps will not pay any price. They went to battle, but others sent them. The public, moral and judicial test will be applied to the three Israeli statesmen who sent the Israel Defense Forces to war against a helpless population, one that did not even have a place to take refuge, in maybe the only war in history against a strip of land enclosed by a fence. Ehud Olmert, Ehud Barak and Tzipi Livni will stand at the forefront of the guilty. Two of them are candidates for prime minister, the third is a candidate for criminal indictment. It is inconceivable that they not be held to account for the bloodshed. Olmert is the only Israeli prime minister who sent his army to two wars of choice, all during one of the briefest terms in office. The man who made a number of courageous statements about peace late in his tenure has orchestrated no fewer than two wars. Talking peace and making war, the "moderate" and "enlightened" prime minister has been revealed as one of our greatest fomenters of war. That is how history will remember him. The "cash envelopes" crimes and "Rishon Tours" transgressions will make him look as pure as snow by comparison. Barak, the leader of the party of the left, will bear the cost of the IDF's misdeeds under his tutelage. His account will be burdened by the bombing and shelling of population centers, the hundreds of dead and wounded women and children, the numerous targetings of medical crews, the firing of phosphorus shells at civilian areas, the shelling of a UN-run school that served as a shelter for residents who bled to death over days as the IDF prevented their evacuation by shooting and shelling. Even our siege of Gaza for a year and a half, whose ramifications are frighteningly coming into focus in this war, will accrue to him. Blow after blow, all of these count in the world of war crimes. Livni, the foreign minister and leader of the centrist party, will be remembered as the one who pushed for, legitimized and sat silent through all these events. The woman who promised "a different kind of politics" was a full partner. This must not be forgotten. In contrast to the claims being made otherwise, we are permitted to believe that these three leaders did not embark on war for electoral considerations. Anytime is good for war in Israel. We set out for the previous war three months after the elections, not two months before. Will Israel judge them harshly in light of the images emanating from Gaza? Highly doubtful. Barak and Livni are actually rising in the polls instead of dipping. The test awaiting these individuals will not be a local test. It is true that some international statesmen cynically applauded the blows Israel dealt. It is true America kept silent, Europe stuttered and Egypt supported, but other voices will rise out of the crackle of combat. The first echoes can already be heard. This past weekend, the UN and the Human Rights Commission in Geneva have demanded an investigation into war crimes allegedly perpetrated by Israel. In a world in which Bosnian leaders and their counterparts from Rwanda have already been put on trial, a similar demand is likely to arise for the fomenters of this war. Israeli basketball players will not be the only ones who have to shamefully take cover in sports arenas, and senior officers who conducted this war will not be the only ones forced to hide in El Al planes lest they be arrested. This time, our most senior statesmen, the members of the war kitchen cabinet, are liable to pay a personal and national price. I don't write these words with joy, but with sorrow and deep shame. Despite all the slack the world has cut us since as long as we can remember, despite the leniency shown toward Israel, the world might say otherwise this time. If we continue like this, maybe one day a new, special court will be established in The Hague. A small tiny entity that's only 60 years old has reached to such heights it has reduced the world's greatest superpower to a humiliating maid. Can AIPAC be that powerful that US politicians would allow themselves to be humiliated in front of the world? Israel's prime minister said Monday that Secretary of State Condoleezza Rice was embarrassed by orders to abstain from voting last week on a U.N. truce resolution for Gaza that she helped arrange. I saw this posted on Syria Comment and found it so moving and real that it was worth promoting here, and elsewhere. La Repubblica in Italy has been publishing the diary entries of an extraordinary young girl from Gaza City under the heading of “The Gaza Diary”. It has rapidly become one of the most popular items in the national press. It’s interesting how, at the most terrifying and horrific of times, we still manage to make light of the events, and even enjoy a dark sense of humor that surprisingly comes out not inappropriate and even the more amusing given the constant state of tenseness and apprehension. My 10 year old cousin was eating a sandwich, when my younger brother, 12, looked at him and, quoting a line from one of his favorite video games in his dead on imitation of the characters voice, while being extremely amused by the fear in the younger boys eyes, said “enjoy it, it could be your last!” I looked at him for a second and began laughing almost hysterically. On another occasion, we looked around for my twelve year old and 14 year old brothers during an intense bout of air strikes and realized that they had snuck back to the living room, the room directly in front of the area being bombed, and were watching a sports channel. “But we had to see the scores” they retorted after being severely reproached”. They’re becoming desensitized, I thought, I went through this before while living in Ramallah in 2002. I laughed so hard, they had become totally oblivious! I’ve had a lot of time to contemplate, the last few days, and looking at my siblings, I wonder how the rest of the world envisions the people who occupy the most despondent and unruly military zones in the world. My younger brothers spend their free time out with their friends, or playing basketball and soccer at youth clubs. They are passionate about sports, play station, and music. They play the guitar and are exceptional students. My brother who’s in collage is obsessed with computers and gadgets, he’s an engineering student who comes up with the most ingenious projects for his classes. He listens to music and plays the guitar and prays regularly. He’s an honor student who has big goals and big dreams. So please understand why I am infuriated when I see how we are portrayed on television. Hordes of bearded, teeth-gnashing, stone throwing blood thirsty savages in rags and tatters. And please don’t blame me for feeling utter rage against the state of Israel, that has been intentionally targeting the unwary, guiltless, promising children and youth of the Gaza Strip in its vicious attacks over the past 5 days. Already, between 40 and 50 children are dead while hundreds lie in the hospitals, seriously injured or disabled for life. The people of Gaza have been suffering for decades under systematic and tyrannical oppression by Israel, the latest of its measures has been the siege and closures imposed on the strip that have completely devastated the livelihoods of Gaza residents and caused the economy to fall into an unprecedented and crippling depression. The people of Gaza have long been denied the means that have been afforded to the residents of countries with the same, possibly less, resources. And yet the amount of resourcefulness and zeal we demonstrate is a testimony to the potential of progress and advancement that lies within us. To the rest of the world, Israel represents the democratic, civilized, patriotic, western, state whose representatives are well groomed, clad in smart suits and silk ties and talking all sorts of political correctness, stringed with terms such as self defense, civilian population, Palestinian terrorists and middle east peace. And so after Israel launched its military offensive against Gaza 5 days ago, claiming that offensive was a retaliation against Hamas’ firing rockets into Israel following the cessation of the period of calm, to many, the Israeli attacks were justified. Never mind that Israel failed to at least ease the siege that has been slowly killing us over the past year (to be more precise over the last 3 years.) Never mind that Israel continued its incursions into the strip and its murder of innocent civilians throughout the truce. Never mind that compared to Isaeli gunships, war planes, tanks and other weaponry, Hamas rockets seem like toys. Never mind that our children are robbed of anything that resembles a normal life and future. And yet we are continuously accused of being on equal terms with one of the strongest military forces in the world. So while being cooped up in the house, watching local news stations when we have electricity, still in a state of disbelief, I wonder if the rest of the world would be so harsh in its judgments if they had the opportunity to understand. I wonder if people would as easily accept the unsubstantiated claims that the engineering faculty building of the Islamic university, which has been flattened during the attacks, was a workshop that produced qassams, if they had seen my brothers reaction. When he came back from a walk to the university building the next day, his face was white as a sheet and he had tears in his eyes. “Its all gone he said, even the project (electric car) we’ve been working on all semester.” We’d seen pictures, I didn’t know whether to laugh or cry. Did he seriously have any hope that the car had survived. A few hours ago, the home of one of Hamas’ senior leaders, Nizar Rayan, was struck by 4 missiles. Not only was the entire building flattened, killing all who were in it, but several other buildings surrounding it looked like they were about ready to collapse. It is said that there were over 19 deaths, most of them women and children, and scores of injuries. The entire street was littered with debris and rubble. We saw the images on tv, children being lifted from beneath the rubble, headless corpses loaded into plastic body bags, the whole works. We sent a taxi to pick up my aunt, whose home lies 100 meters away from the Rayan building, and had caved in due to the attack. She and her children arrived, shaken, but all in one piece. Today the temporary halt of rocket fire coincided with the restoration of power to our home, at least for a few hours, at about 5pm. My brothers went to their rooms and played their videogames, I sat on the couch and read, and my sister went to take a nap. We tried to busy ourselves with regular daily activities in a situation that is anything but commonplace. We prayed for rain, and at last rain came tonight. A heavy, tumbling shower of clear refreshing beautiful rain. We prayed for rain hoping that it would blind the visual capacity of Israeli warplanes and Israeli gunship for the night. We prayed for rain to combat the fires that have been rising from homes, due to the attacks. We prayed for rain to wash away the heavy layer of sooty residue from rocket fire and debris that coated our building and our balcony, and to clean away the ashes and dust that lay heavily on the street. We also prayed for rain to cleanse our street of the sewage water that has started to seep from the drains near the pavement. For over a week now, waste pumps have stopped working in Gaza city because of the lack of electricity. If it hadn’t been for the cutting off of running water, our streets would be flooded with sewage water. As it is the sewage water is already beginning to rise. We don’t know whether we should close the windows to keep out the stench or open them so they don’t blow in, in case of an attack. Israel announced a 3 hour ceasefire today, in order to allow trucks of aid to enter Gaza, loaded with food and medicine. Our joy at 3 hours of peace was unbound, and we quickly began to ready ourselves to go to stores to buy some necessary items and some not so necessary, such as chocolate and chips. The time allotted was from 1:00 pm till 3:00 pm. Our hopes began to fall as we heard continuous artillery fire at about 10 minuets to 1, in the close by Zatoun area. They almost dissipated (our hopes) when I called a friend from that area and he told me that he had barely escaped the shelling. We stayed put, but at about 2:00 pm we went into our rooms and changed back into our sweat suits and heavy sweaters. Within the first hour of the ceasefire, Israel had launched 8 attacks. 2 homes were destroyed, collapsing over the residents in Rafah. 3 more homes sustained heavy damages due to artillery fire. A warplane bombed a civilian car in Jabalia, in it was a man who was driving taking his 3 sons and one of his relatives to buy bread, in what they had supposed, was the safety of the ceasefire. The drivers name was Khaled Kahlout. The ages of his children were between 10 and 15. In Beitlahia, warplanes struck a residential area while shelling could be heard in the distance. Today is the 12th day of the attack and the only change we have witnessed throughout this period is the steady rise in the intensity and ferocity of the attacks. Israel is solely targeting residential buildings, houses, civilian cars and farming fields, and on a much wider scale. We spent the rest of the day trying to get over the disappointment and wondering at the state we have been reduced to. To become overjoyed at the opportunity of walking in the street and shopping for necessities, and to lose faith to the extent that makes you feel your not worthy of even that, is a sad, sad thing indeed. We all sat in my brothers room this morning listening to Jalal recount his story. He is one of my brother’s close friends and colleague in the engineering faculty. For the past week my brother had lost touch with Jalal, who’s home lies in the most dangerous neighborhood in Gaza city, al Zaytoun. This neighborhood has been closed off by the Israeli military with earthen barriers, even ambulances aren’t allowed in, while houses are being demolished over the residents’ heads. Tens, if not over a hundred people have already died there, and that’s why my brother was so worried about Jalal, being unable to reach him by phone. Jalal called my brother yesterday evening to tell him he was ok, and came over to see us this morning. Let me tell you a little about this incredible young man. Jalal comes from an extremely poor family, who’s situation was aggravated after his father lost his job due to the Israeli siege imposed on Gaza 19 months ago. Jalal is a very distinguished student, one of the top in the entire university, and professors marvel at his intellect, manners and perseverance. He walks an hour and a half a day to the university, and walks back home because he can’t afford public transportation. Unlike his fellow students, he can’t afford new cloths or even shoes, and wears old sandals in the middle of the cold winter. Yet he manages to continually get high grades and would have been able to finish his 5 year degree in 4 years, if he could afford to pay for the extra credit hours each semester. His small scholarship and what money he can muster up already leaves him short of part of the tuition. Therefore, when Jalal told us his story, it broke my heart to see such horrendous circumstances inflicted on such an undeserving and already afflicted person. Jalal, his brother, 4 sisters and mother had spent the last 4 days in a UNRWA school, that has been turned into shelters for Gazans who were forced to flee their home (15000 people) and where 48 people have already died due to attacks on these schools. The second day of the Israeli ground invasion a family was massacred in their home (the samouni family) only meters away from Jalals parent’s house. 30 people died that day. The next day Israel began to bomb the area with the internationally banned cluster bombes, large bombs that explode into smaller bombs once they hit the ground, “balls of fire” as Jalal called them, As the bombs fell the area was under heavy shelling that penetrated the asbestos roof of their home, they had to sleep in the kitchen, the only room with a concrete roof. The ground attacks began on Sunday. The next morning as Israeli warplanes were striking with their cluster bombs, a “ball of fire” came in through the open back yard door and rolled past his sister. Another set their barn on fire. The family left their home on Monday. Jalal’s father stayed behind fearing that if no one was there the house may be taken over by the military. He’d rather die there than allow the invaders to enter. “What happened to the animals?” my younger brother asked. It’s all true, Jalal sighed as we all stared dumbfound, thinking for a moment that this performance was meant to make us laugh. I woke up to the smell of freshly baked bread, at around noon today. I stay up most of the night and catch a few hours sleep after the sun rises. The house was freezing cold, as it has been for the past few weeks. I put on a number of heavy sweaters and a robe and wrapped a scarf around my neck, readying myself for yet another day if incessant drones and constant nearby explosions. My mother has taken to making homemade bread the last ten days. Thanks her careful management of the small amount of cooking gas we have, and to her idea of buying a gas oven in anticipation of an Israeli invasion only days before the attacks began, she is able to bake occasionally. Furthermore, we had found a store with its doors partially open in our area a couple of days ago and were able to stock up on flour. Having lunched with my younger siblings and my parents on bread, cheese, eggs and some leftover pasta, we all went out onto the balcony, and what a beautiful sunny day it was! The iciness had dissipated somewhat with the early day sun, the few trees outside were green and luminous and birds were singing! We all stood for about half an hour, looking out through the metal railings like caged birds. We could hear an occasional explosion in the distance but that did not deter us from standing there breathing in the fresh air we so longed for. It was time for the daily chores. My 3 brothers took 3 containers downstairs, where the residents of the 14 floor building we live in crowded around a small tap that had running water. Luckily we are on the second floor, most of the others had the task of walking up and down the stairs. All of our area has been without water for about a week. When they got back me and my sister poured some of the water into pails in the bathrooms and in the kitchen, and tried to tidy up the house as much as we could. My father, a physician who’s medical center is located on the ground floor of our building, went down to see a few cases. During this time his patients try to keep in touch with him via phone only, but some emergency manage to make it to his clinic. The first few days of the attack we were all glued to the radio, but for the past few days, being confined to our home, we have begun to become restless and agitated. I have started to read again, and write using a paper and a pen instead of my laptop. My brothers are spending time with the neighbors kids inside our building and my sisters try to keep the phone occupied for as long as possible (very inconvenient) . We have also began to spend a lot of time together, and value each other as people, friends and companions instead of just family. Later that evening we all gathered around are television, after turning on the power generator, which we do for only an hour a day, due to the extreme shortage of fuel. Today was different however. There was non of the usual excitement, the rushing to charge cell phones and check emails, the flipping between TV channels… The atmosphere in our home, which had come close to being gay earlier in the day, was somewhat downcast and gloomy. We all understood what the other felt, we had lead the exact same life for the past 11 days, we had grown into the exact same state of mind, and we were experiencing the exact same emotions. Instinctively, and by the collective mentality of a people living under tyranny, not to mention the feelings communicated by family and friends, and the surprisingly similar courses of speech and action we knew that the state we were in was reflective of every single household in the entire strip at the moment. It was a state of unease, a state of nervousness, disquiet, dissatisfaction and need to experience life again. It was a state that made you feel lost in limbo and wandering if the real world ever existed. It was a state of wanting to be anywhere but here, wishing that the clock would turn back and things were as they had once been before. It was a state of missing your school, your friend who you will never see again, your office that had been destroyed and the corner store that has been turned into a pile of rubble. My mother looked at us all and, in a soothing and understanding voice said “its ok, at least we have our home, at least we’re together, at least we’re safe”. “But what does that mean if you’re entire life has been taken away from you” asked my 13 year old brother. At that moment a news report was telling the story of the the Samouni family in Alzaytoon area of Gaza city. 60 people living in one large building. Several families, brothers, their cousins their children and their nephews and nieces, their elderly parents. 60 people. Israeli tanks entered Alzaytoon last night and called on the family to stay within the building through microphones after posting a tank outside their front door. 60 people in the house. Israel proceeded to bomb the house, striking it through artillery fire. At least half of the 60 people died, the rest were seriously injured. One young man who had survived was sobbing hysterically as he lay in the hospital bed and the camera rolled. That morning our relatives had left in order to clean out the rubble from their home and try to make it as inhabitable as possible. We worried for them, but the activity on the street told us people were ready to resume their lives, at least partially, despite the ongoing offensive against the city and its people. Today we came close to experiencing the destruction and disposition experienced by 15 000 Palestinians in the past 13 days. As we sat down to a dinner made from scratch we heard a loud explosion that seemed to come from right above of our heads. We sprang up and didn’t know what to do. Should we go outside? If the building was being targeted that would be dangerous. In a matter of seconds tempers had flared and we proceeded to argue over the next course of action. Our argument was cut short by a banging on the door and shouts coming from outside “The building has been hit!! Evacuate the building”. It took us a few seconds to gather ourselves, and we immediately sprang to action, gathering small bags containing our official documents, pulling on jackets and shoes, grabbing cell phones and rushing to the door. We made our way downstairs along with the residents of our 14 floor building and ran across the street, gathering in front of the gate to the UNRWA headquarters. Everywhere you looked people hung on to each other, young children stared open eyed and infants wrapped in blankets began to wail. A fight arose between two men from the building and an UNRWA guard. The guard refused peoples request to open the gate and allow them to take cover inside. “If anything happens our children’s blood will be on your hands” screamed the impassioned father. “Go to the UNRWA shelters”, the guard screamed back, there’s one 10 minutes away. 48 people have already been killed in these shelters and we all new that. We found out what happened as an ambulance pulled up to the curb. “It was just a small rocket” someone said. “There was just one injury, a small boy on the 12th floor, a block from the wall fell on his back, the rocket came through the window. Small rocket, everyone can go back to their apartments”. Were we supposed to be relieved?? Because we weren’t. I prayed for the boy as we made our way down the street, each 2 at a distance from the next. We have learned from walking in a group is dangerous, we walked about 300 meters and decided to head back. Where were we going to go? Reaching the entrance of the building we saw that some people were walking away with bags, perhaps going to shelters or relatives homes. Other’s were angry and vowed never to leave their homes, or smiled and made light of the situation. A few were afraid that this “small rocket” meant that a larger one was coming. There was much debate among my family. My mother wanted to take my siblings to a friends basement apartment, my brothers and father, always the biggest jokers, said that since we were on the first floor, if something happened, we would just jump out the windows and make a run for it. We walked into the building together and decided to go to our home. Before going in I took a look at the night sky. The stars were beautiful and seemed to shine brighter than ever. I counted 5 Israeli warplanes in the sky.